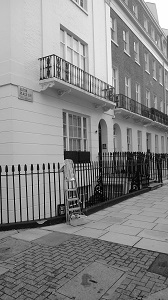 Today Spick & Span window cleaners went down to Belgravia SW1 to clean the windows of a Luxury 1st floor flat, set within a beautiful Georgian street in Eaton Place, Belgravia London, SW1. This first floor flat was located within yards of Belgravia Square and just a stroll away from London’s Sloane Street, SW1. The windows of this apartment, in Eaton Place, Belgravia, were cleaned at the behest of a personal assistant who was required by her boss to arrange for the window cleaning of this exceptional Belgravia property. The windows were extremely dirty and quite high up, and difficult to reach in places,all of the windows were cleaned on the inside and outside many of which were accessed from three balconies, others were cleaned by opening the sash windows and cleaning them with a micro-fibre cloth. Spick & Span window cleaners took great care in cleaning the windows around the property and whilst cleaning. Each window cleaning job whether it be in Belgravia SW1 or another area of South West London presents its own unique and individual challenges to a window cleaner, and window cleaning the windows of this property in Eaton Place proved to be no exception, however with the many years of window cleaning experience that Spick & Span have gained; challenges can usually be met successfully. The main difficulty of this window cleaner job in Belgravia SW1 was that the windows had not been cleaned for a number of years and so were extremely dirty, also some of the windows were difficult open, there were also a number of french door glass that needed to be cleaned.Another thing that made this job quite labour intensive was that the windows that were all cleaned on the outside were multi-pane and therefore had to all be thoroughly scrubbed with two micro-fibre cloths.Another obstacle that had to be overcome was that the owner of this flat needed the windows cleaned within the day, and Spick & Span had to notify a security guard of their arrival. The window cleaning of this property in Belgravia also had to be carried out at the same time that the domestic cleaner carried out their duties. The end results of this window cleaning in Belgravia SW1 were very pleasing, because the windows were noticeably cleaner. Making the property look even more attractive and appealing, the house cleaner was really impressed with the results.